and honed (Matt) granite, but all the stone had to be lifted 12 floors. 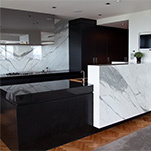 The owners of this property have been so delighted with the work of the designer and Adriatic Stone, that they keep coming back. in the marble were carefully lined up, and edge joints made seamless to give the solid look required by such a long bench. It is this ‘finesse’ that makes Adriatic Stone stand out amongst stonemasons. 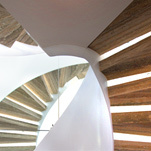 This magnificent beach-side house features a spiral staircase between floors. The challenge for Adriatic Stone was that each stone step was a wedge that had to fit into an individual shape within a previously fabricated steel frame. Position and levels were critical. Adriatic Stone’s tradesmen meticulously worked within these restraints to ensure the quality of the job matched the grandeur of the house. The result was stunning. 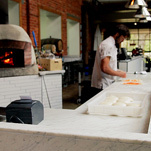 The Epicurean used Adriatic Stone and the subtleties of marble bench tops to tie together the food preparation and serving areas in the pizza/pasta restaurant. Using the same marble in a delicate hearth for the open fire, continued this warm visual link. For this fireplace, Adriatic Stone used book-matched pieces of marble with mitre joints to give the impression of it being a solid piece. The secret to this is an exact join, which Adriatic excels in through the use of its specialty cutting equipment. 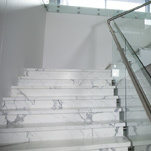 To manufacture and assemble a grand marble staircase, such as in this Safety Beach house, requires exact measurement as well as precision manufacture and careful assembly. The superior skill of Adriatic Stone's tradesmen delivered brilliantly. The elegance of marble and the contemporary look of glass and stainless steel, formed a perfect match for the house. CNC milling equipment that is rare among stone companies in Melbourne. 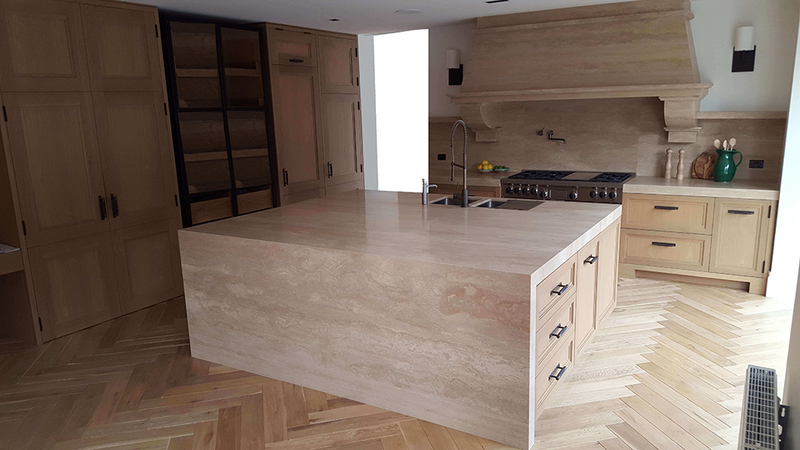 What made the finished article stand out was the attention to detail and precision provided by the Adriatic Stone tradesmen. 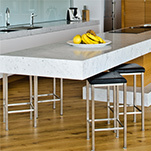 edges such as those on the basin are cut with extreme accuracy with Adriatic Stone’s precision machinery.